If you haven’t guessed by now then this should be the true give away shot. Yes, I have bought a bicycle. 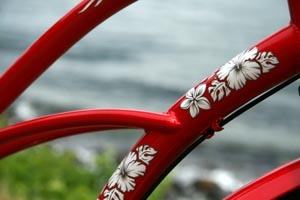 It’s an Electra Hawaii Cruiser. 3 speed. 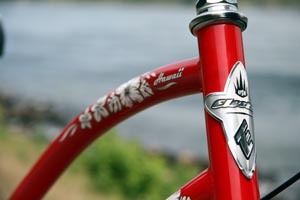 Coaster brakes. It’s not built for speed but then again, neither am I.
Isn’t she beautiful? If you read Claudia’s post from a few days back then this probably isn’t a big surprise. 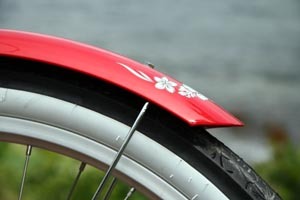 Claudia gave me some great advice on purchasing a bike and then turned it into a really helpful blog post. Really, if you’re thinking about a bike then talk to Claudia. My bike, which came from REI – what a great store! – had to be ordered because they didn’t have the red in stock. I think it was well worth the wait, though. We picked it up Thursday night and I road it around the neighborhood for a while. Friday I did my first BAT/KAT run as I road it to Town Hall to pay our tax bill. We took our first big excursion on Saturday and went to the canal and road the bike path there. We had a great lunch in view of the Bourne Bridge and probably biked about 5-6 miles total. That’s not a lot of miles but it was enough for our first trip. I got loads of compliments on my beautiful new bike and that was cool. And every time she got a second look, I rang the bell. Riding this bike is a blast! Nice! 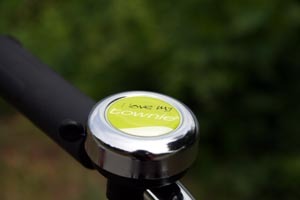 I have sort of considered getting one, but a) I never really learned how to ride well, and b) there’s no where close enough to allow a bike to let me cut down on car use. So… I don’t know. Oh, it’s beautiful! Have a fantastic time riding! 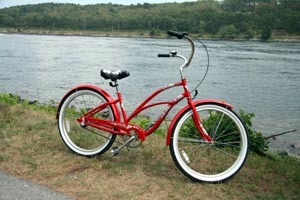 Love the cruiser! 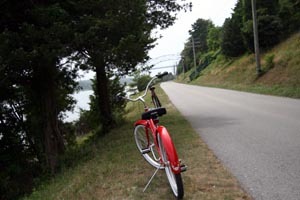 I’ve got a Schwinn from the 60’s that I have got to get out of storage and out on the road. How cool! Happy riding, just think of all the gas you’re saving (and calories you’re burning!). 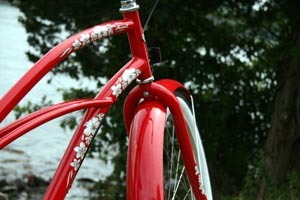 What a fabulous bike! Long may she roll!! Mazel Tov! You have given yourself the gift of good health. The only thing which you must add is an odometer… it counts the miles. You will be amazed at how they add up. You will compete with yourself. You will become addicted. You will discover that you sleep better, eat less, see more… make lots of friends and discoveries.